Mind you, these were taken with my phone, so they're not very good. ok all except for these top 2 that were taken this morning. 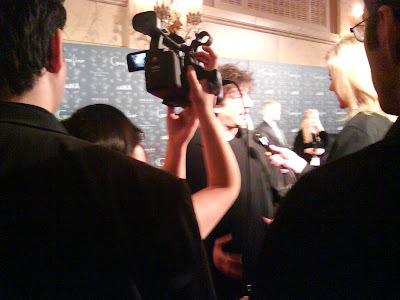 A very fuzzy and bad picture taken of Neil Gaiman as he came closer to the FilmFever guys. The first set to greet the people walking into the after party. 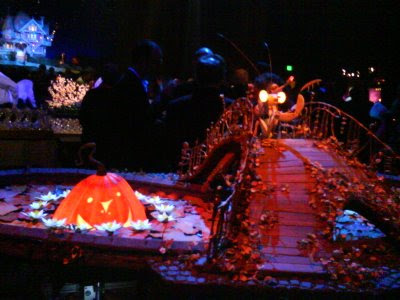 This is the Coraline garden and all hand made and TINY! The set for the Bridge scene with a Praying Mantis, aka Zorak. 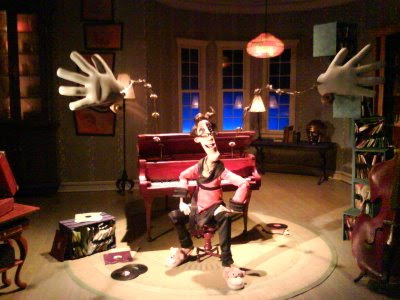 You can see Coraline's house in the background. Take a look at the scenary around, kids. This thing was small! 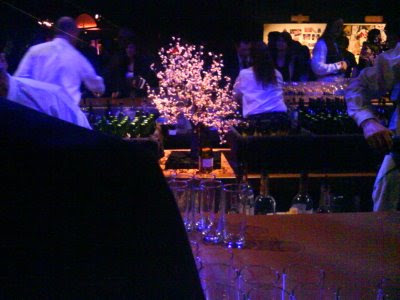 They used the Cherry Blossoms for the bar; these were also part of the Coraline set. 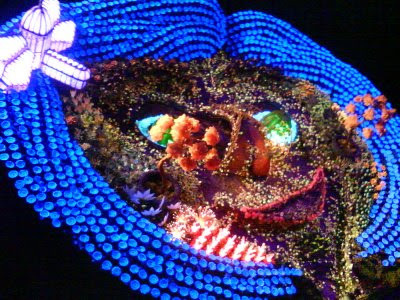 In the next pic you can see that they were made of spray painted popcorn! 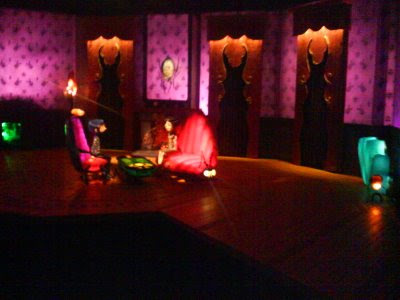 The set of the Other Father's Study. Close up. Everything here was hand created. The records in the bins... everything! 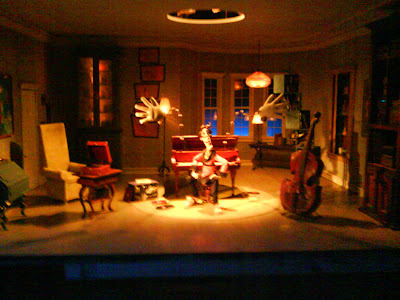 The only shot I could get of the set of the Other Mother's living room. These were all so amazing! There was soo much attention to detail and EVERYTHING was made BY HAND! I was in awe. It was really neat stepping into such a fantastic world. 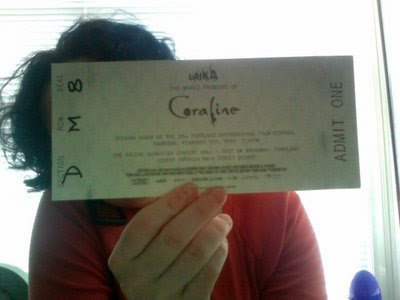 I got to see Coraline in 3-D and if you can I highly recommend it. 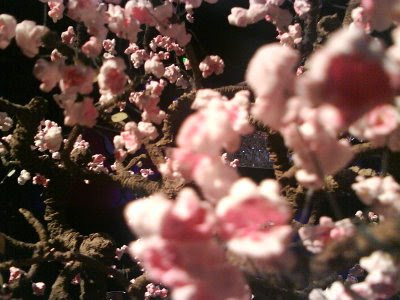 I felt that it gave it a wonderful depth that made the world seem more alive and more fantastic. Seriously loved it! How awesome for you!!! Wow everything does look unbelievable! 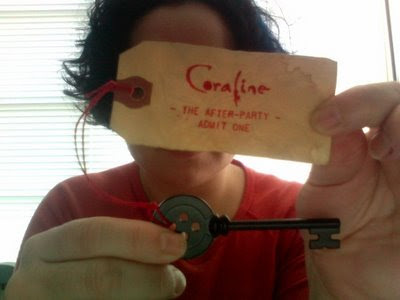 I swear you gave me the Coraline bug now I just have to bribe the hubs to come see it with me. @Bee I'd be curious to hear what you thought of it. I'm a big fan and I had read the book so to me I got it perfectly. I've heard complaints from some that the beginning is to slow and from others that they thought the end was bit of a mess, story wise. So I'd really be interested to hear your thoughts if and when you do. Try to see it in 3-D! It's really amazing and not cheesy at all!